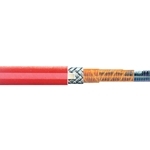 Anderson-Bolds sells Constant Wattage Heating Cable. Constant Wattage Heating Cables are ideally suited for applications where a particular watt density is required at all times. 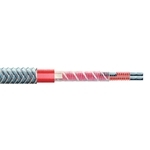 The heater element consists of a nichrome wire wrapped around parallel, insulated buss wires. Constant wattage cables are flexible, can be cut-to- length in the field, and are manufactured for use on voltages from 120 to 480V. Although not suited for overlapping, its constant output makes it an ideal choice for higher temperature applications where higher watt densities are required. Constant Wattage Cables are Equipped with a ground braid and can have an optional FEP jacket. Constant-Wattage heat trace provides precise and constant temperatures up to 500oF (260oC). 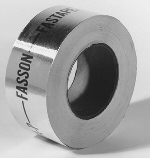 Ideal for a wide range of applications. Please note that there is a cutting charge of $42.00 for BriskHeat cables for lengths under 100 feet. 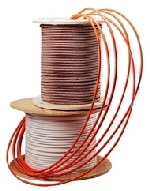 All prices for heating cable are given for a single foot of cable. Please set the quantity to the number of feet of cable you require. BriskHeat Heating Cable, 4 w/ft, 120 vac, Constant Wattage, Harsh Environment with Teflon Overcoat. Brisk Heat Heating Cable, 4 w/ft, 208 vac, Constant Wattage, Harsh Environment with Teflon Overcoat. BriskHeat Heating Cable, 4 w/ft, 240 vac, Constant Wattage, Harsh Environment with Teflon Overcoat. 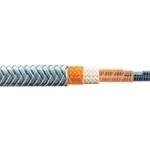 Brisk Heat Heating Cable, 4 w/ft, 480 vac, Constant Wattage, Harsh Environment with Teflon Overcoat. BriskHeat Heating Cable, 8 w/ft, 120 vac, Constant Wattage, Harsh Environment with Teflon Overcoat. Brisk Heat Heating Cable, 8 w/ft, 208 vac, Constant Wattage, Harsh Environment with Teflon Overcoat. BriskHeat Heating Cable, 8 w/ft, 240 vac, Constant Wattage, Harsh Environment with Teflon Overcoat. Brisk Heat Heating Cable, 8 w/ft, 480 vac, Constant Wattage, Harsh Environment with Teflon Overcoat. BriskHeat Heating Cable, 12 w/ft, 120/60, Constant Wattage, Harsh Environment with Teflon Overcoat. BriskHeat Heating Cable, 12 w/ft, 208/60, Constant Wattage, Harsh Environment with Teflon Overcoat. BriskHeat Heating Cable, 12 w/ft, 240/60, Constant Wattage, Harsh Environment with Teflon Overcoat. Brisk Heat Stainless steel pipe straps. Adjustable from 2� to 6�. 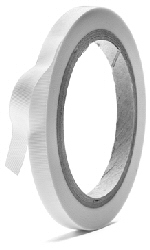 Brisk Heat Pressure Sensitive Fiberglass Adhesive Tape. Conduit Hub w/Grounding Lug for CWM or SRG cables. 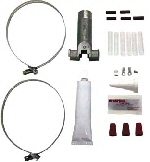 RTES End Seal Kit for Heating Cable.